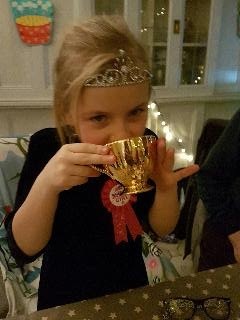 Well another year has rolled around, the blog rejoins our 'story' with Freya turning 8 years old. Which means that Edie is now 6 and very much marching to the beat of her own drum. I am hurtling towards 40 this year while Craig looks better than ever and he is turning 45. Despite a flagging thyroid gland, Moomin remains the best dog in the world. We are still happily living in 'Belgravia' (Darwen not London) and very little has changed, we have been too busy with mini adventures to have achieved any 'remodelling' of the house. It is all looking a little bit tired as the last time we decorated was before the children were born. I remain working on CCU within the, sadly failing, NHS and Craig is part of a team management at sofology. My mum has had surgery for her chronic bowel disease and is now fit as a flea and busy to boot. While dad is really struggling with the early stages of dementia. On the other side of the country, in Immingham, as similar tale is true with Ray struggling with his memory while Pat is busy with Zumba and aquatone. In Chislehurst, Stephen is suffering with his feet while Sally is managing to work full time as a physio in the community. Cameron is so grown up now and enjoys Games Workshop shenanigans. Aimee is being investigated for weakness in her ankles which they suspect is a Vital D deficiency. They have done what no one would have guessed and just become proud owners of Noddy a retired greyhound. Becky is recovering from pneumonia after coughing through New Year. She is facing a massive change in circumstances now that Serge's 14 year old daughter is coming to live with them permenantly. They are having a large extension to cope with the extra body in the bungalow. Lee is working very hard at his own scooter business while Jussie works and holds the fort at home. William is kickboxing and has just taken up Rugby. Glenn seems to have found happiness at last with Donna in their cosy home. Sadly, the situation with Clayton and Hollie remains as complicated and bitter as ever. I am in a very privileged position of being able to be a homemaker and a working mum but must admit I struggle to do things for myself. I have decided to be more proactive with my time management to enable me to fit in things that I once loved... blogging, running and decorating the house. In a nutshell that is where we are at.